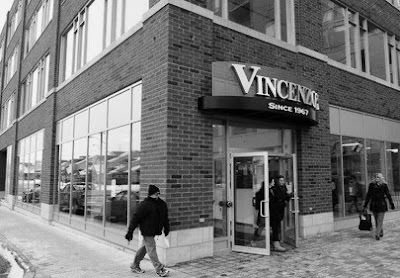 One of my favourite food shopping experiences is to visit Vincenzos in Waterloo, owned and operated by brothers, Tony and Carmine Caccioppoli, 2nd generation Caccioppolis in Canada. "Today Vincenzo's is known locally for having the best sandwiches in town. They carry a wide selection of olive oils, vinegars, homemade pasta, olives, deli meats, cheese and their famous "Artichoke Caponata ". Vincenzo's carries a wide selection of homemade specialities, such as homemade pasta, sauces and pasta dishes always in the tradition and commitment of using only the best and freshest ingredients in everything made on the premises." Vincenzo's new location also includes a Butcher, Flower Shop, Seafood, Gelato Bar and Cafe. You can read more at their website here: Vincenzos, including reading the moving story about their humble beginnings in 1951 from Naples, Italy to Canada.